In the market for a new ride? Before you start shopping, it's a good idea to get pre-approved so you can go out and find a vehicle that fits both your needs and your budget. Take our auto loan payment calculators for a spin and complete your pre-approval application with some basic information—and we'll help get you on the road to start shopping! Apply online receive an instant 24-hour approval*! *Approval subject to credit qualification. Response times may vary. In some instances, members may be asked to contact the credit union before a decision is made on their application. Complete your pre-approval application in less than 10 minutes. In a hurry? Log into your account on Shine Online Banking, and you'll be done in 5! To fill out the pre-approval application, we only need some basic information that gives us an idea on what kind of vehicle you're looking for. A Dupaco lender will be in touch with you shortly after the pre-approval application has been submitted to discuss your budget and financing options. While you’re at it, request a free Money Makeover, and you could free up extra cash and potentially save thousands. Still have questions about the pre-approval process? Check out our FAQs below. When you have your auto loan at Dupaco, you'll receive a great rate and a variety of loan terms to choose from, with personalized service you can count on. Plus, you can lower your loan rate through our Cooperative Loan Giveback, which rewards you with rate discounts for your credit union loyalty. See the Rates tab below for more information. Apply today by calling our Consumer Loan department at 800-373-7600 / 563-557-7600, extension 202, or stop into your nearest branch! 1Auto Loan Rates: Loan annual percentage rates (APR) based on member credit qualification and total loan amount. Rates are subject to change without notice. Mini-Max Loans: Add 1% to conventional rates. Savings, Checking, $1,500 or more in a savings or loan account, direct deposit, automatic payment, Dupaco VISA card, and any one of the following: Certificate, IRA, Home Equity Line of Credit, or other loan: .15% discount. 3Auto loan payment example for illustrative purposes only: If you borrow $10,000 at 3.39% annual percentage rate (APR) with a 60 month term, your minimum monthly payment obligation would be $181.43. Over the life of the loan you will pay $885.52 interest. Dupaco offers a lease-like option, too. Does Mini-Max sound like the right option for you? Is a pre-approval different than applying for a loan? Yes! When you apply for a pre-approval, your credit is checked in the same fashion as a regular loan. However, the difference lies in that the pre-approval doesn't require you to provide information about the specific vehicle you want to purchase, making this the ideal option if you want to determine how much you can borrow, while shopping around, in order to narrow down your choices. Check out the many advantages of getting pre-approved here. How long does it take to get pre-approved? In most cases, the pre-approval application takes less than 10 minutes to fill out, and you may get a response right away. However, there are times when we have questions about your application or simply need more detailed information, and will follow up with a phone call before a decision is made. Either way, the confirmation message that comes up when you submit your application will let you know. Will I be charged a fee for getting pre-approved? No. There is no cost to apply for a pre-approval or an auto loan online though Dupaco. I found the car I want, now what? You are now ready to complete the loan process. Be sure to get in contact with the Dupaco lender that you have been working with. In most cases, you can sign paperwork electronically without having to come into a branch. Once all of the paperwork has been signed, the funds will be transferred into your account so you can complete the purchase! Payment Protection* is a voluntary loan-payment protection product that helps you get relief from the financial burden of delinquency, default, or foreclosure if a protected life event unexpectedly happens to you. Depending on the package you select, if a protected event does occur (and you’re a protected borrower or co-borrower on the loan), Payment Protection will cancel or reduce repayment of your loan debt—helping to lessen your worries, and your family’s worries, about paying loans during this difficult time. With Payment Protection, every eligible member pays the same fee and you only buy enough protection to cover your loan balance. Tying protection directly to your loan means you’ll have exactly the right amount of protection—no more, no less—while helping protect your family, collateral, and credit rating. For eligible borrowers, enrollment in the program is fast, easy, and immediate. Learn even more about Payment Protection. Mechanical Repair Coverage is optional protection available on eligible new and used vehicles, and protects you against many of the costly auto mechanical repairs no longer covered by your vehicle’s manufacturer’s warranty. Repairs can be made at any ASE Certified Mechanic, and the repair facility is paid directly by the plan; you only pay the deductible amount when repairs are completed. Three packages are available with varying amounts of coverage, and different deductibles. The warranty program also includes rental reimbursement, towing reimbursement, 24-hour toll free roadside assistance and emergency travel expense. GAP is an optional insurance designed to eliminate any unpaid loan balance in the event your vehicle is stolen or damaged beyond repair as a result of an automobile accident. GAP may cover the amount of the loan balance left after the payment from your primary insurance company and ultimately can help to protect your credit. Quite often when a vehicle is considered “totaled” the cash value is less than your outstanding loan balance. GAP coverage can ease that burden by paying the difference between the actual auto loan balance and the insurance settlement. The coverage is available on new, used and refinanced autos, and for your convenience the premium can be built into your loan payments or paid at loan closing. Financing a car doesn't have to be complicated, and neither does finding the right car. Use AutoSmart to make vehicle shopping a whole lot easier. I had an account with you years ago and had it for several years. Unfortunately, I went through a bad divorce which led to financial problems and in the end I defaulted on my loan and closed the account resulting in me filing bankruptcy in 2012. I have a very stable job. I really want to get a vehicle and finance through Dupaco however I want to know if you give people a 2nd chance? Hi Kim, we'll have a lender reach out to you and see how we can help. We currently have an auto loan through you and payments are taken via EFT. I have changed bank accounts and am wondering how I change my EFT so it comes out of my new bank account. Hi Kim, we'll have a loan processor reach out to you and get your payments updated. I have moved recently to this area. The Credit Union I am in now is 100 miles away to the nearest office. I now live 30 miles from Carroll. Can I transfer all my accounts to your office in Carroll without a lot of problems? Hi Letta, yes, you can become a member at Dupaco and have all of your stuff transferred easily. :) We'll have someone at our Carroll branch reach out to you. I was wondering if the due date could be changed so that I can do auto bill pay and keep them on time. Hi Connie, we can certainly work with you on that and will have a member service representative contact you. I'd like to pay my dupaco auto loan with bill pay. What address do I use for the payee? I have set up an account with Shine Online, but I don't know how to pay my bill. Hi Allison, we'll have one of our lenders reach out to you and walk you through the steps to make a payment on your loan in Shine. Hi Wendy, we'll have one of our lenders reach out to about auto loan rates. I was looking into a vehicle that has been repaired but is considered a salvage title. I don't want to pass up this vehicle being as good as it is. Do you finance people who are interested in a vehicle with a salvage title? Hi Drew, yes, we do finance vehicles with salvage titles. I would like to refinance an auto loan. Is it possible to get the 2.54% interest loan? Hi Robert, we will have someone from our Consumer Loans department reach out to you. Thanks! 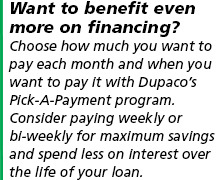 Can I take a car loan from Dupaco if I only have a saving's account at Dupaco. If yes can I have the loan funds transferred to another bank account? Hi Simeon, yes, you can absolutely have an auto loan with just a savings account here, as that makes you a member of the credit union. :) Once we have the loan approved and all signatures, we can wire the money to another financial or directly to the dealer - this would incur a $20 fee for the wire to be processed. You can apply through Shine Online Banking or right here from this webpage, or you can give us a call or stop into your nearest branch. Can i make my payments on line? Hi Carol, yes, you can make an auto loan payment via Shine Online/Mobile Banking. We'll have someone reach out to you and help step you through the process. Hi Dani, We currently do not offer an option to delay payments on loans. If you are running behind, or if you know something may be coming up that would cause some issues making payments, we encourage you to reach out to our Member Solutions department at 563-557-7600 / 800-373-7600, ext 208. Hi Mysti, since everyone's situation is different, we will have someone from our Consumer Loans department contact you. I'm currently not a member (yet) and I wanted to know how long does one have to be a member to apply for a loan? How long does the process take and will I have to provide a down payment. Thank you for your time. Hi Joy, when you become a member, you can apply for your auto loan right away. The process and down payment amounts depend on your situation, so please feel free to stop in or give us a call. If I were to move a car loan from another bank to you, could I add anther car to that loan? The loan is for $11.000 and I would be adding about $22,000. Hi Clarence, someone from our loan department will be in contact with you shortly. How long does it take to process an auto loan? You can apply online, in person, or over the phone. If you are already a member it can be a same day process. If you have any additional questions regarding auto loans, please feel free to call our Consumer Loans department at 800-373-7600 or 563-557-7600, ext 202. What is your loss payee clause for auto loans? Do you refinance RV's in Hawaii? Hi Sharon, Dupaco can certainly look into refinancing your RV in Hawaii. Please feel free to call our Consumer Loan department at 800-373-7600 or 563-557-7600 ext. 202. Does Dupaco have a minimum credit score requirement for a camper loan? Tara, It all depends on the situation. It may be easiest for you to stop into a branch and talk it over with one of our member service representatives! Hi Jessi! Extra auto payments can be made at any time. Members can pay however they feel most comfortable so online, in branch, or sending a check. The extra payments will push the next payment due date out so if they pay ahead and realize they are a running short on cash they can pay less the next month.